Marcus Eaton From Boise, Idaho is On The Fast Track and Rising To The Top! There are individuals in the music business that have songwriting in their blood and embody all the elements of a rising star. They are gifted entertainers who have been around the recording process their whole life and wish nothing more than to be on stage full time. They are poets who can write eloquent songs that last a lifetime. For Marcus Eaton, the road to success was inevitable. The young star was around music for most of his life, had a father who recorded with some big names and had the good fortune of a recording studio in his home which introduced Eaton to the inner workings of a thriving studio. Eaton, now 31, knew at an early age that songwriting and playing music was all he wanted to do for his livelihood, career path and profession. It was just a matter of time before his dreams came true, the doors started opening and producers started noticing this diamond in the ruff. Originally from a little town in Idaho, Eaton came of age during a time that jam bands were gaining strength in the music scene. 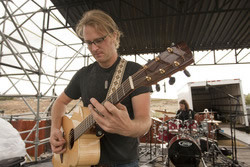 Bands like Dave Mathews, The Spin Doctors and Phish were touring in support of the Horde Tour and Eaton was following the new generation closely. Instead of playing in high school bands doing cover songs, Eaton was busy writing originals like a gifted natural. Eaton says, “Growing up around names like The Carpenters, Art Garfunkel and Anne Murray, crafting songs was something you just did. It was a process that my dad showed me and one that came pretty easily”. 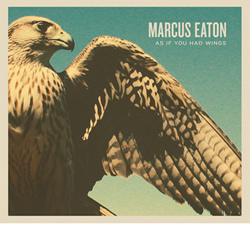 Eaton’s unique writing style is evident on the new album, As if You Had Wings. The 10 track masterpiece opens with a song called Life in Reverse and gives the listener a taste of high energy, big sounding, polished songs which could be easily featured on mainstream radio. 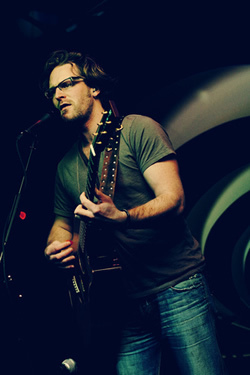 Most of the tracks have multiple styles ingrained in the music and it shows the wide spectrum of influences that Eaton has adopted. At the core of it all is a jazz-based, alternative-rock-infused recipe that Eaton has put together for the world to hear. The song Dreams of Flying has that soul based, funk-rock style that grooves and moves with amazingly heartfelt vocals behind it. In mid song, the tempo changes to a lighter, meandering chorus, but then switches back to that funk driven push. This song is well executed, powerful and professionally done. Other songs on the album could be featured on movie soundtracks or background sound for commercials; proof that Eaton knows what he is doing and can rival other greats out there. In the last year, Eaton has been on the fast track, touring the states, opening shows for Tim Reynolds and recording with the legendary David Crosby. Call it “right place at the right time” Eaton has this energy of attracting promoters who want to give him a VIP pass to the next level of success. But, paying dues and learning the ropes was something that Eaton had to do on his own playing hundreds of shows around the country and developing a loyal fan base one show at a time. Eaton has definitely put his time in and he is now reaping the benefits. Eaton is a humble and passionate “kid at heart” who is mesmerized by his recent success and riding the wave to stardom. But, the music Gods are watching Eaton closely before he enters the gates to national recognition. One thing is clear, Eaton has what it takes to tour nationally and capture the hearts of those in the community. Eaton and I spoke on the phone while he was on tour in the Pacific Northwest, doing a handful of shows in preparation for a bigger tour in the Northwest with Tim Reynolds. Eaton isn’t in any rush to conquer the world and has the patience needed to make it in a challenging market. Good things come to those who wait and Marcus Eaton has waited long enough. He’s talented, he’s ready and Eaton is willing to do whatever it takes to get his message out to those who want to hear great music. You’ve had a great year Marcus, how did you connect with David Crosby? I was opening for Tim in Aspen, Colorado and a guy came up to me after the show. He said he enjoyed the performance, bought a cd and we exchanged email addresses. A couple weeks later, I got a message from him asking if I would come out to Omaha and play his Christmas party. We worked out the details and I found out that this guy Norm Waitt started Gateway Computers. So, you might say that he is a heavy hitter. He became an instant fan of my music and had us out to Omaha to play. I then learned that he has a music label that put out a few David Crosby albums and a band called CPR that David has with his son. We kept in touch and Norm said he wanted to introduce me to Crosby because he was a good friend and the two of us “had to get together”. We met up in Santa Monica, had dinner and got the chance to hang out. I have to be honest, I’ve had so many instances where stuff falls through and people say a lot of things that never happen. So, when I met David I told him we needed to play music sometime. He told me that it would happen someday and I thought, yeah right, there’s probably a good chance we won’t be able to do it. Last summer he came through Idaho where I live, sent some emails and had been listening to some of my tracks off the website. So, I called him to get together while he was in Boise and sure enough we had dinner and got to strum some songs together. He showed me these open tunings that were beautiful and Crosby’s son even came into to the hotel room to watch. They loved it and a couple months later Crosby called and asked if I would play on his new album that was coming out. I couldn’t believe it and didn’t tell anyone until it actually happened. I thought that I needed to keep it under wraps until it came to fruition. They sent me two tracks that I played on initially. I played them and didn’t know what to expect, but Crosby liked what was going on and said “I think we should write together”. Sure enough we did just that and the album has evolved into this amazing collaboration between him, James his son and me. James is an incredible musician and I look at playing with him as a huge honor and success. It has been so cool in so many different ways, something that I never expected would happen. It is really special too when I think about it. Last night you were in Washington State, how was the gig, what was the energy like and describe the evening? It was a small turnout, but, the energy was good at a little place called Jazzbones, in Tacoma Washington. The club owners have never really done anything during the week. Their main shows are on the weekends during school. So, they started a Wednesday night performance and I played with only my bassist last night. Normally, we are a three piece band or I play solo. Ironically, we had an awesome night just the two of us; there was great energy and we got to stretch out. When I do a solo show it incorporates a lot of looping, so I did a lot of percussion loops with the two of us playing over the top of it. Congrats on the new album ‘As If You Had Wings’. What was the process like for that and where was it recorded? It was done in Boise Idaho and it was a really great album to do. It was a culmination of writing that I have done for the last four years, starting right after the last album. We put some songs down including a surprise track called Dreams of Flying that wasn’t supposed to be on there. I have been playing with a great drummer for three years named Kevin Rogers. He made the experience so awesome. The last album was tough on me trying to find the right musicians, actually every aspect of it was challenging. The studio was difficult to get, we lost some tracks, but this time it went smoothly and I had a great rhythm section. The guy who mixed it was Mario McNulty who finished it in New York and did an incredible job. He added a whole new element to the songs. How is the tour going, are you in the middle or is this a short one before something bigger? This trip we are doing now is an extrapolated tour throughout the northwest. We have three more shows here, then off for a week before we head out on the road with Tim Reynolds and TR3. We start that in Denver after some time off to rehearse and get ready. We have some great gigs booked with a really fun band. The bass player is Ben Burleigh with Kevin on drums and we are having so much fun playing music with each other. Everyone is so talented, quick with coming up to speed on song arrangements and we all jell really well. I am excited to be playing with Tim Reynolds, he was on the road with Dave Matthews for three years and he hasn’t been doing a lot of TR3 stuff lately. With Tim getting back out on the road, it’s going to draw some great crowds. I am so excited to play in front of these audiences who appreciate good music. Take of us back to high school, what were some of your early bands and where did you come of age? Well, I grew up in Pocatello Idaho and it was on the east side of the state. It’s a sleepy little town with Idaho State University right there. My dad is a musician and we grew up on top of this hill out in the middle of nowhere. We had two television stations so we didn’t watch it in the early years. That helped my brother and I develop our creativity and started playing the guitar when I was 9. I formed my first band ESP as in Extra Sensory Perception, when I was 16 with a drummer, so we were a duo. That is when I figured out that music was going to be my thing. We wrote our own music and only occasionally did we do cover songs. My dad was a songwriter; he wrote songs for The Carpenters, Art Garfunkel, Anne Murray and had a lot of success with it. Writing material was never a foreign idea, it just came natural and it’s what we knew. Sometimes, bands start off playing a lot of cover songs and then eventually they start writing their own material. For me that’s where I started and feel really lucky to have taken that approach and to have been around it in the family. I had so many experiences with musicians who would come through my dad’s studio. He had it set up in the basement and would do a lot of recording so I got to hear it right there in the house. Through osmosis at a young age, I would learn about art and see some real culture in such a small town. What were your dreams back then in high school and as a young adult? What was going through your mind musically? There was a lot of cool stuff going on at the time. We listened to so much music as a kid, but, one of the first albums that was on a lot was Nothing Like the Sun by Sting. We had a lot of Paul Simon, James Taylor and Stevie Wonder. All of my dad’s music was inspiring. Then I got into Blue’s Traveler, The Spin Doctors and more funky, upbeat music. I remember Dave Matthews came out at the time The Horde Tour was going around the country. We saw the show on a ski mountain, it was beautiful outside and I said to myself, “I want to be on that kind of stage doing exactly that”. Those were my goals, even in high school I remember thinking that I could do it right at the time I got hooked on Tim Reynolds. I heard him play and thought that it would be great to open for him some day. That was a goal of mine and I feel so lucky to have the opportunity to do that. All I wanted to do was be on big stages with great musicians, so you might say my dreams are already coming true. The first time you opened for Tim, did you get paired up through your booking agent or was it a right place at the right time occurrence? I had moved from Pocatello to Boise and we started playing around there. We developed a following pretty quickly and as soon as we did that, we started a relationship with a local promoter because we were pulling 500 people to the show every time we played. I saw that Tim was coming to town, called the promoter and told him “Tim was one of my guitar heroes and I would really like to be on that bill”. The guy said “no problem”. I had Tim’s road manager Fluffy Centner and I traded music with him and said I would love to do this again. I sent him a cd and the next year, he called and said the opener broke his arm, would I like to come to Salt Lake to open for Tim. Then again in Boise, he said “we should get you on these tours because you and Tim would be great”. It was a great situation and Tim has always been my musical hero. I heard a story once about David Crosby 40 years ago pulling up to an intersection and hearing his new hit on the radio. Or maybe it was another musician’s song being played on the top 10 and David was blasting it on the car stereo. I’m curious in this day and age of multi media, what would be a similar type of success today? There are so many ways to determine success, and for me having a band that has been signed shows some merit. But, then our early album lost steam. We had a booking agent and then we lost that. So right now, every little thing is a success instead of that ebb and flow. Getting involved with the right people and having them help publicize the show is success. This whole Crosby thing is a huge milestone because he is somebody who is a legend, an amazing person and a true mentor. James his son is an incredible musician and I look at that as a huge success. The band and the music would be incredible to hear on the radio or on commercials. We have so many songs that are relevant socially like “Eleven” with a chorus of “Do you want to change the world”. We’d like to find a niche commercially. On the other side, touring and playing to bigger audiences is something I have always sought after. Right now keeping the momentum is very important because we do some big shows, but then a night later we play to 20 people in a smaller town. Consistency is key. When would you say you first felt that momentum where there was some kind of buzz happening with the public acknowledging you? Can you pinpoint that? I have felt it a few times but one in particular comes to mind. We were in Boise in 2002 and started doing these opening shows. We started pulling hundreds of people and I felt the energy and growth of the band. But, that dissipated for a long time. And now I am feeling that momentum again where I am a more developed artist. As If You Had Wings is my fifth studio album and personally I think life experiences bring so much to the table musically. I have honed my craft and the songs continue to get better as well as the songwriting skills. Realistically, I feel like I am barely hitting that stride where there is some buzz going on, and have this project with Crosby with the right people and the right band. That has taken a really long time to accomplish. How would you describe your style in simplest terms? I would say something like progressive, singer songwriter, or as I call it, eclectic. I can pick up a guitar and play you the songs by myself, but its way more than that. We have odd time signatures, very syncopated songs and a full sounding band. It sounds like you have a lot going on, but is there anything missing in your life right now? No, I feel really fortunate everything has happened in a great way. Earlier experiences have helped redefine myself and my music to move forward and feel like I have a great balance. I would like to be playing more and to larger audiences, but I have faith that it will come. This Crosby situation is mind boggling, I feel really fortunate that we’ve connected and he does too. What ‘s planned for late Spring and this Summer? This summer we will be finishing the Crosby project, then more touring. We haven’t really promoted this album and still trying to find a home for it. We are also talking about a European promotion, where there is someone who has expressed interest in getting the word out about it. Of course, we have to continue playing as much as we can. Thank you for your time Marcus, we wish you a lot of luck this year, Jambandfriendly.com supports everything you are doing.